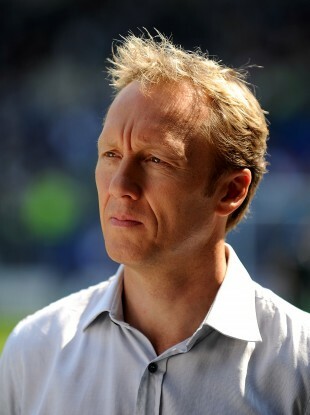 Lee Dixon will be part of the US coverage of the Premier League. From Pelé, perms and the Cosmos in the brief 1970s glory days to the excellent Twitter spoof @USASoccerGuy, quoted above describing England’s equaliser against Scotland in midweek, US coverage of the world’s biggest sport has long been ripe for parody. But it is a sign of growing confidence that the Premier League is ready to break through to the mainstream that it is one of the big US networks, NBC, that has most recently been poking fun at itself as part of a huge advertising blitz that amounts to a full-scale relaunch for English football in the US. While English television viewers have been under siege before Saturday’s kick-off from a blitz of pre-season publicity from Sky Sports and its latest rival, BT Sport, a similar campaign has taken place across the Atlantic over the summer. Star players have stared down on Times Square, the aforementioned viral parody (starring Saturday Night Live star Jason Sudeikis as Tottenham Hotspur’s new American coach Ted Lasso) has been racking up YouTube views and a more traditional approach has been introducing the US public to the nuances of English football rivalry. To the stirring strains of Nessun Dorma, the faces of fans contort in agony and ecstasy to a tagline that references another successful British import: “Forget Downton Abbey, the real English drama is coming on August 17″. A number of factors have coalesced to foster a belief among clubs, broadcasters and Premier League executives alike that it is primed for take-off in the most saturated and competitive sports marketplace on earth. Premier League football is cool in the US all of a sudden, becoming the sports viewing choice of hipsters on college campuses who want to stand out from the crowd. An estimated 24m Americans play the game but, crucially, it is now making the leap from participation sport to television spectacle. The steady if unspectacular growth of the MLS and the continued success of the US national team have helped but NBC will market the Premier League’s high octane mix of passion and skill as the “real thing”. Clever billboard ads, such as one featuring a map of the Five Boroughs divided into the colours of the 20 Premier League teams, exhort potential viewers to “keep calm and pick a side”. It is through hooking them into the romance and history of individual clubs that NBC executives believe they will turn curious US sports enthusiasts into avid soccer fans. Meanwhile six of the Premier League’s clubs now have US owners, including three of the most “storied brands” of all in Manchester United, Liverpool and Arsenal. Most of those owners also have US sports interests and have been attracted by a curious combination of the absence in the sport of rigid rules that govern US franchises, meaning more potential upside, and what they see as the opportunity presented by Uefa’s Financial Fair Play rules to turn their clubs into sound businesses. But there is no doubt that they share a common mindset and that all are considering how they can sell their newly acquired assets back to their homeland as well as making them a success in England and across the world. NBC has gambled heavily on that potential, paying $250m over three years to outbid ESPN and Fox for the rights. It will show all 380 Premier League matches live on its fledgling sports network, with bespoke pre- and post-match programming from its hi-tech studios. Crucially it will also air 20 key matches on its main network, showcasing Premier League football across the US. An American version of Match of the Day, modelled on the BBC original, will round up the action on Saturday nights. Rebecca Lowe, Robbie Earle, Arlo White, Lee Dixon, Graeme Le Saux and Robbie Mustoe are among the familiar names who will be employed as presenters, analysts and pundits. While the extent to which the Premier League has become a global entity has sparked another round of concern about its effect on the national team, in many ways it is the very fact that it is such an international prod that allows sometimes parochial US audiences to buy into it. One intriguing side story will be the effect of the burst of Premier League hype on the MLS, to which NBC also owns the rights. Dixon said that while football had always been popular among kids in the US, a range of factors had combined to ensure that “all of a sudden, people are taking American football as in soccer seriously.” “It’s very exciting to be involved in,” added the former Arsenal right back, who said he had been taken aback by the scale and professionalism of NBC’s onslaught, which was already equal to or greater than anything on offer in the UK. Email “Opinion: Why the Premier League is bigger than ever in the US”. Feedback on “Opinion: Why the Premier League is bigger than ever in the US”.